Almost as exhilarating to watch as it is to paddle the Class IV and V rapids, the High Falls whitewater dam releases in Jackson County North Carolina are a must-see outdoor experience. With seven prescribed recreation flow days a year, the experienced kayak enthusiasts get the chance to paddle a 6-mile section of the West Fork of the Tuckasegee River from the base of High Falls to the take-out near the Thorpe powerhouse. 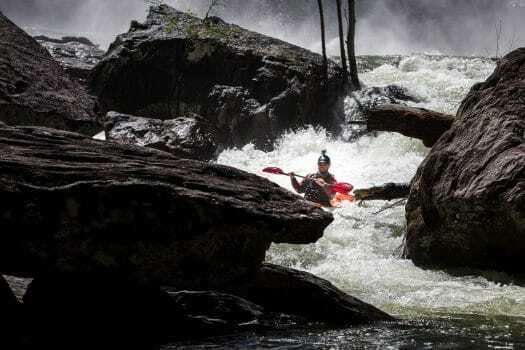 Kayakers can click here to learn more about these challenging Class IV and V rapids. And for hikers, viewing the roaring falls and kayakers launching from the base is just as adrenaline-charged. Get there early for premier positioning and to view the quiet falls from the banks before the raging water ensues. Remember, Safety First – don’t stand under falls before the release; that wave of water happens fast and there is little chance of dodging it. You can also observe the kayakers at the take-out near the Thorpe powerhouse along N.C. 107. High Falls (also called Cullowhee Falls) is located just below the dam for Lake Glenville near Cashiers. On most days, this serene setting is worthy of the trip in itself. 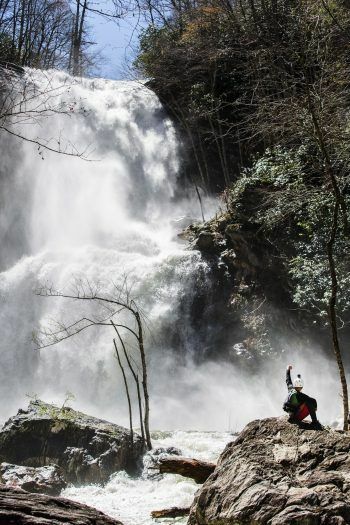 Normally subtle, the 150-foot double waterfall is a small stream cascading over the cliffs of the Tuckasegee Gorge. The trail to High Falls was built for the kayakers, however, the primary users are hikers who want to see the falls. The total length of the trail is 0.70 mile from the trailhead to the kayak put-in at the base of the falls. You don’t need to hike all the way to the bottom to see the falls, but it does give you a great vantage point. The elevation drop from the trailhead to the put-in is 650 feet, about 73 flights of stairs. Not too bad on the way down, but keep this in mind for the hike back up. The trail’s bridges are made from Hemlocks, while the steps, handrails and water bars are made from Locust and boulders, all harvested on-site. On a spring hike, there are many wildflowers in bloom along this trail, including trillium and violets. The Pines Recreation Area is also home to a swimming beach and picnic area, with a fishing pier and restrooms. Rent a pontoon, paddleboards, or kayaks at Signal Ridge Marina or Lake Shore Marina & Sea-Doo rentals and see three major waterfalls on Lake Glenville. Cashiers Sliding Rock puts you in the water for a slide down to a shallow pool. For the hiking enthusiast, the 2.5-mile roundtrip loop hike at Whiteside Mountain puts you front and center with amazing mountain views from spectacular 700-foot high cliff walls. Dine with the locals. For grab and go type of food, try Cornucopia Restaurant or Slab Town Pizza, both in nearby Cashiers. For higher end options, take a look at the Library (in Sapphire NC) or Randevu and Canyon Kitchen, both in Cashiers, NC. Parking is just past the Glenville Dam on Pine Creek Road (off of 107) at the Pines Recreation Area. The street address is 1966 Pine Creek Road, Cullowhee. GPS coordinates 35.198262,-83.159715. Click here for a map. Use the hashtag #PlayOnNC in your social media posts, and we may just feature your photos on our social channels.